As you plan your holiday, here’s what Metro is up to so you can factor us into your celebrations. In keeping with tradition, Metro will offer free rides on New Year’s Eve, with the goal of reducing traffic congestion and providing safe transportation for those staying out extra late. No fare will be charged on Metro Rail and Bus lines from 9 p.m. on Tuesday, Dec. 31, until 2 a.m. Wednesday, Jan. 1. Please note: free fares will only apply until 2 a.m. Those boarding buses and trains after 2 a.m. will need to TAP to ride. Fare is $1.50 per direction per line or $5.00 for a Day Pass. On Dec. 31: Metro buses and trains will follow their regular weekday schedules. 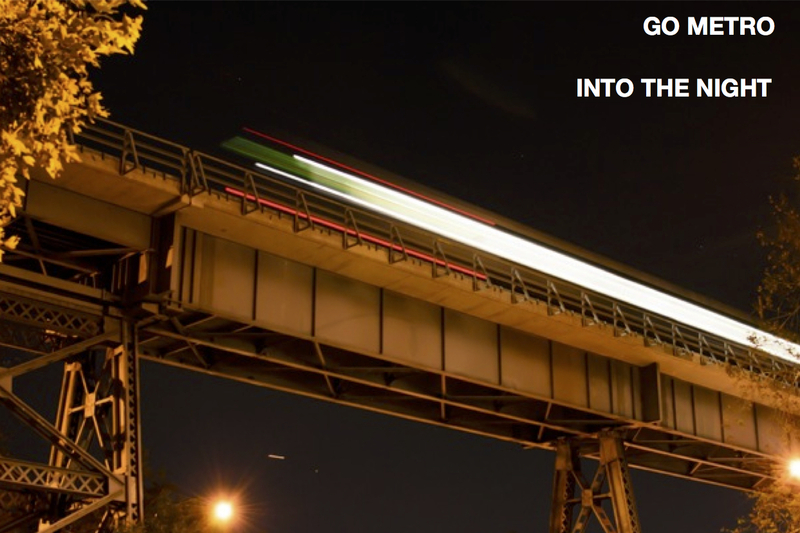 On New Year’s Eve (Dec. 31-Jan. 1): Metro will provide all-night service on the Red, Purple, Blue, Expo, Green, Gold, Orange and Silver Lines in addition to bus lines which normally operate late-night owl service. Trains will run at 20-minute intervals from 1 a.m. to 3 a.m.
On New Year’s Day: Metro buses and trains will follow Sunday/Holiday schedules. The only exception is the Metro Gold Line, which will run longer trains at more frequent intervals between Union Station and Pasadena for those going to the Tournament of Roses Parade and the Rose Bowl game (Here is more information on getting to the Rose Parade and the Rose Bowl Game and to see the floats after the parade). Additionally, numerous Metro bus lines along the Rose Parade route will be detoured or split into two segments at Colorado Boulevard until streets are reopened. Please refer to individual timetables for the exact hours of holiday service on our various bus lines, and note that some bus lines do not run at all during Sundays/Holidays. Also note that from 7 p.m. Dec. 31 thru 3 a.m. Jan. 1, the Downtown Long Beach Station will be closed due to a New Year’s Eve celebration on Pine Avenue. 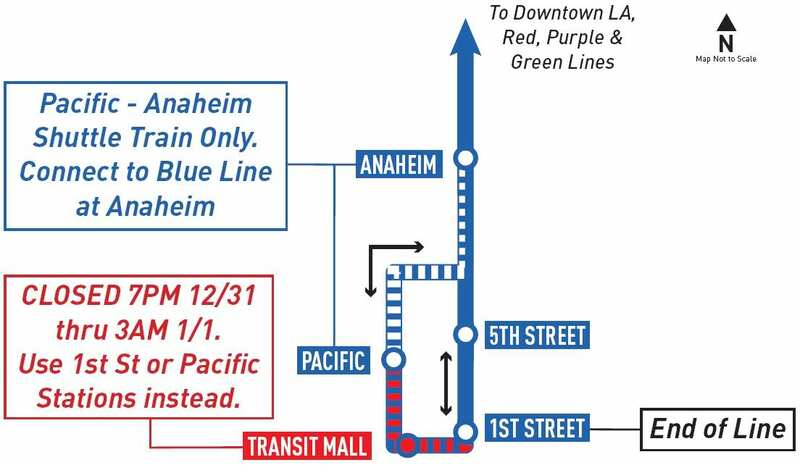 As a result, Blue Line will operate modified service during this time: trains will run every 20 minutes between 7th Street/Metro Center and 1st Street Station, while a shuttle train will run evekry 20 minutes between Anaheim Street Station and Pacific Avenue Station. Please see this service advisory for more info. Metro thanks our customers for their patronage and patience this year, and hopes our service helps make your holiday a little brighter. The best thing Metro could do is to have people at stations selling TAP cards with day passes on them for $6 cash. That would alleviate some of the long lines we find at these events and avoid issues of the “one fare one line” since the Day Pass would cover those situations completely. I believe we might have our TAP ambassadors doing that at Civic Center/Grand Park and at Universal City Station due the expected crowds heading there for NYE parties…but I’ll check and suggest if not! In addition of free rides being offered after 9pm tonight (X-mas Eve) and on New Year’s Eve, are the turnstiles (at most stations) going to be unlocked? Yes, turnstiles will be unlocked during the free ride hours. Do they allow fold up chairs on board the Gold Line? You may be able to get a couple of small chairs on board but I can’t guarantee anything — if you try, bring something small that won’t block aisles or doorways to better your chances in case you encounter Metro personnel or deputies. 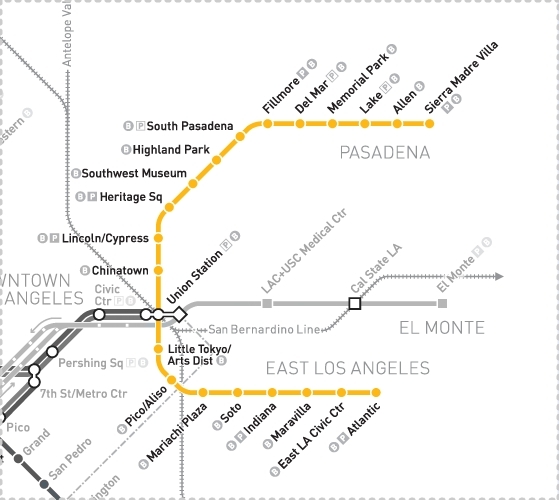 How come the Metro Gold line or any trains are not Free New Years Day? Why is it only restricted to be free up to only 2am>? Please advise. Thank You. According to metro’s web page, silver line will have all-night service on new years eve, and we trusted the information is true. However, we waited at the silver line northbound stop at 7th street metro center from 1:45am-3:10am, but no silver line show up at all!!!!!!?????? What happened?????? Impossible! The Silver Li(n)e (i.e. Bus 910) is “just like Rail Transit, only Cheaper”! Actually, I am surprised you actually found the 7th Street/Metro Center Silver Li(n)e Stop at all, given the lousy signage. The Silver Line was always supposed to run just hourly during the overnight hours, and was not at the same level as the Orange Line. Definitely file a complaint, though.